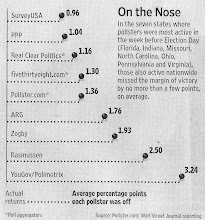 -Only one candidate has a net favorability number of better than +5. That's Mike Castle in Delaware at +19 (51/32). -20 of the 31 major candidates in those 15 races have negative favorability numbers. -Obscurity may be a plus. 4 of the 9 candidates with positive numbers are still unknown to 40% or more of the voters in their states. For the most part this year the better known a candidate has become the less well liked they've been. -The races where voters like their candidates the least are Colorado (average fav of -18), Nevada (-12.5), Illinois (-12), and California (-7). The ones where they like their candidates the most (or perhaps dislike the least is a more appropriate way of describing it) are Delaware (+9.5) and Wisconsin (+1). Here's the full data. What other interesting observations are there? Are the current candidates really that weak, or is it just that politicians in general (with few exceptions) are very unpopular at this point? RON JOHNSON IS A MULTI-MILLIONAIRE IN WISCONSIN AND HAS A 18-20% RATING? Jim DeMint is missing from this list. Such good data. Extremely interesting to see these numbers. Thank you and great work. Most any other year, voter approval versus not, might be a fairly good gage of whats to follow in the upcoming elections. But, this time around I don't consider approval numbers, for a given candidate, to be as much a factor as it's been in the past. Republican voters, in particular, are so engaged and as well enraged against anything Democratic (as in party), that liking or not liking a particlar Republican candidate is not, nor will be (in general) the deciding factor in voting for that candidate in the general elections. This year's Republican vote will be a vote more against Obama, his policies, leftist agenda and the Democratic Party that has and does support him - far more so than anything else. What might be more telling are the breakdowns by party ID. Is it across the board or just by party? I'd guess most have a huge negative score with the other party, although Toomey beats Sestak by 10 with the other party, 7 in his own, and 16 with independents. On the other hand, Buck/Bennett is 8 vs. 9 with the other party and 24% vs. 22% with indies. Buck loses by 15% with his own party. Yet, he's only behind 4% with his own party in the voting. I think a bit of the negative is that the candidates aren't beloved by their own party. NV LV are more likely* to believe Harry Reid is extreme than to believe that Sharron Angle is. Even these PPP #s show Angle to have fewer unfavorables* than Reid.